A controversial blueprint setting out land for home building in Denbighshire has been narrowly approved by county councillors. The authority had earmarked several sites for 7,500 new homes but a planning inspector wanted more land selected. It has now backed 21 new sites offering scope for another 1,000 homes. Opponents claim homes in some new locations would add pressure to local traffic, water and power supplies. The local development plan (LDP) makes provision for homes to be built in Denbighshire over a 15 year period from 2006 to 2021. Last year a planning inspector presiding over a public inquiry into the plans ruled that the council had not allocated enough land to meet its growing housing needs, suggesting 25 more sites. The authority agreed to consider 21 of those sites which were formally accepted at a meeting of the council on Tuesday. 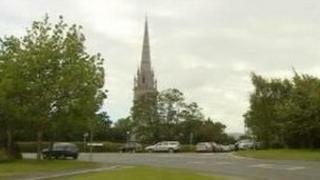 One of the main seats of opposition is in the village of Bodelwyddan, designated as a key strategic site with land earmarked for 1,715 new homes and 26 hectares (64 acres) for employment, as well as a primary school and community facilities. There are also significant development sites allocated in Rhyl, Meliden, Rhuddlan, St Asaph, Denbigh, Ruthin and Corwen. Smaller sites to meet local needs have also been identified across the county. A new settlement tier for hamlets has been introduced in the plan, allowing limited affordable housing development in very rural areas for people with local connections to the area. A total of 1,400 new homes have already been built as part of the plan and a further 1,750 have planning permission. Many councillors are still unhappy about the land earmarked. However, the decision to formally adopt the LDP was approved by three votes, with 21 councillors in favour and 18 against.